Growing Your Plumbing Business? Don’t Live Without These Plumbing Software Features. So you run a plumbing business and you want to grow your business. You’ve heard all about automating your plumbing business through field service management software. But you’ve been wondering if you really need all those plumbing software features. Okay. Ask yourself some questions: how many water heaters do you have in your warehouse right now? How long is it going to take to get that information to you? And will those figures reflect the sale of the 50-gallon Rheem water heater that one of your field techs just installed? Do you ever run of Inventory? If your current system doesn’t give you those answers – in real time – you need to automate your business with field service management software that has all the plumbing software features you need. If you still have doubts, there are many other questions you can ask yourself — and if you don’t know the answers instantly, you need to bring your plumbing business into the 21st century with field service management software. Do you know where all your technicians are right now? And how long is it going to take you to find out? Are you or your dispatcher going to have to call each of your technicians to find out where they are? What if you get in an urgent call from a good customer and you have to go pick up a new low-flow toilet from your plumbing supplier – Ferguson’s Home Depot whatever – and you want to send the technician that’s nearest to the supplier to pick up the item when he’s finished with the job. Will you be notified the instant he finishes the job? Will you be notified when he leaves the current customer’s location? If you’re using field service management software, you should know the answers to all these questions — instantly. If you can’t answer these questions, you need to look at automating your business with field service management software. Do you use Invoices and Work Orders that require everything in triplicate? Does your dispatcher have Post-It Notes all over his/her desk? Do you sometimes send a plumbing tech to the wrong address or with the wrong equipment? If so, you need to look into field service management software to eliminate the paperwork and eliminate the errors and duplications. Then there’s the problem of payroll. Many plumbing companies keep their technicians on two time-clocks – one for checking in and out at the beginning and end of each day, and another to check in and out of each job, so you know exactly how much time any tech has spent on any job. This is very useful for a number of things, including calculating payroll, resolving disputes between you and your customers or between you and your field tech. Field service management software totally has all the plumbing software features that you need to handle the issue of payroll calculation and management. Is your accounting function fully automated? Do you know how many sales you’ve made this period. And how do those figures compare to last year – or any other period? How many of your accounts are right now still unpaid and which are past due? And how long will it take your accounting department to generate these reports for you so your Accounts Receivable people can go straight to work and start collecting? With field service management software, all this information is instantly at your fingertips – in real time. You, or anyone in your company that you designate, can have instant access to all your financials at any time from any location – from a desktop or tablet computer, and even from your smartphone, so you can stay on top of your plumbing business and be able to respond to anyone anywhere at any time – even if you’re in a meeting, at lunch, at home, or on the beach. With field service management software, you have access to every aspect of your business at all times. Now, with our plumbing software, you can automate your entire business in a single step. FieldSurf, the field service management system that’s taking the plumbing business by storm, has all the plumbing software features you need in one place from a single dashboard – or even from your smartphone. FieldSurf has it all. It turns your Scheduling and Dispatching functions to totally eliminate duplication, errors, and paperwork. Its built-in GPS location feature lets you pinpoint all your techs in the field – in real time. FieldSurf also uses “geofencing”, so you can set it up for you (or anyone you designate in your company) to be notified when your plumbing technician leaves Beverly Hills and enters the West Hollywood geographic area. Talk about plumbing software features! FieldSurf is one of the few automation systems on the market that has a module that gives you total control of your Inventory. When a water heater or a toilet enter your warehouse, it gets entered into FieldSurf, with a picture of the items and its barcode, together with the number of units received. When one of your technicians takes a water heater or toilet out of the warehouse and places it in his service vehicle, FieldSurf records that. When your tech installs the item at your customer’s location, FieldSurf automatically records the sales and educts one item from the inventory of both your technician and your warehouse. With FieldSurf you always know exactly what inventory you have on hand and you never run out because FieldSurf will alert you when you reach a certain pre-determined level. FieldSurf has many more incredible plumbing software features to automate your business and bring it into the 21st century. Your Work Orders and Invoices are all generated electronically with FieldSurf. Your Invoice is then transmitted instantly by email to your customer from your field tech’s smartphone. FieldSurf even allows your techs to accept credit card payments in the field using a swiper. If this isn’t enough, FieldSurf totally automates a plumbing company’s accounting function, including payroll calculation and financial reporting. 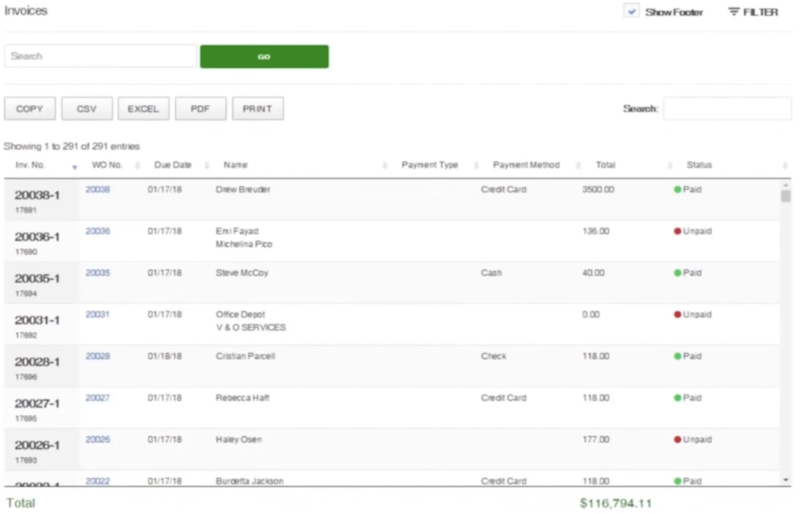 And FieldSurf even integrates seamlessly with Quickbooks, if that’s the system you’ve been using. If you’re looking to grow your plumbing business, you need to look at field service management software. And if you want all the important plumbing software features that are necessary to grow your business, look no further than FieldSurf. FieldSurf is cloud-based, with nothing to download or install. It can be accessed from any computer with an Internet connection. FieldSurf is easy to learn and easy to use. You can be up and running the day you sign up.